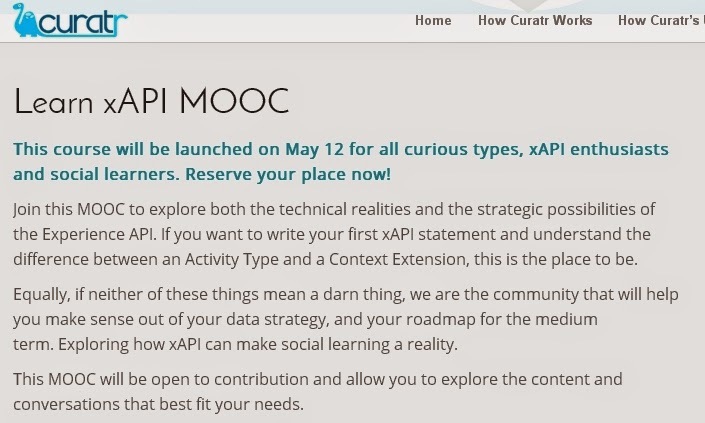 Combining xAPI with #MOOC learning? Yes! xAPI represents a small step and a giant leap for learning-kind. In many cases, the small step will modernise how organizations go about storing, sorting and sharing learning data built up around online courses. The giant leap will enable more personalized learning experiences, allow us to measure ROI and make corporate learning all about performance, not completion. Join this MOOC to explore both the technical realities and the strategic possibilities of the Experience API. If you want to write your first xAPI statement and understand the difference between an Activity Type and a Context Extension, this is the place to be. Equally, if neither of these things mean a damn thing, we are the community that will help you make sense out of your data strategy, and your roadmap for the medium term. This MOOC will be open to contribution and allow you to explore the content and conversations that best fit your needs. Just sharing two new free options (one journal and one newsletter) that are filled with interesting articles on mobile learning (including a focus on lab experiments) and learning analytics (including a regional viewpoint). The Learning Analytics Community Exchange newsletter is out, addressing the latest learning analytics research projects and ongoing ideas from the LACE community. There is a new series of country reports from scholars renowned for their contribution to national and international learning analytics research: a Dutch, Korean, Chinese and a Taiwanese perspective. The newsletter also features interviews with Learning analytics experts and their views into the Future. And one evidence based article is placed into the spotlight (I like this focus): The ‘Evidence of the Month’ on the site for April 2015 is a paper from this year’s Learning Analytics and Knowledge (LAK15) conference, ‘Crowd-sourced learning in MOOCs: learning analytics meets measurement theory‘. 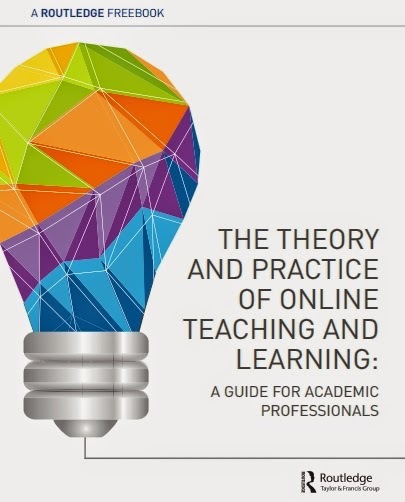 Routledge offers a free (pdf) eBook on the subject of "the theory and practice of online teaching and learning: a guide for academic professionals". It is an eBook comprising 60 pages of useful eLearning information. The authors are known UK experts: Gilly Salmon, Diana Laurrilard, Allison LittleJohn to name but a few. It is a nice synopsis describing key concepts and basic practical options. 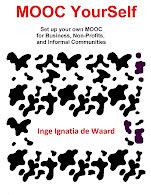 Although it is a free eBook, your contact details are required before Routledge sends you the download link. 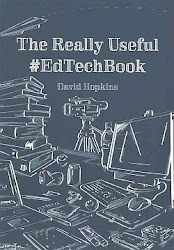 Chapter 1: the basics: This chapter takes on some basic but important questions about online teaching: how is it different from teaching in a traditional classroom environment? Do I need to be a computer expert? How can teaching online benefit my students? How can it benefit me? In answering these questions (and more), the book offers practical tips designed to help instructors make the most of their online teaching, regardless of their level of experience with Internet instruction. Chapter 2:: In this chapter, from Essentials of Online Course Design, Marjorie Vai and Kristen Sosulski run through the basics of an online course and address questions such as how the timing of online teaching and learning differs from the timing of onsite teaching and learning. They also give you a sense of what sort of preparation and maintenance work goes into designing and teaching an online course, and provide some useful time-saving tips. Chapter 3: This chapter introduces you to what author Gilly Salmon calls ‘e-tivities’: “frameworks for enabling active and participative online learning by individuals and groups.” These collaborative activities can be adapted to a wide array of different situations. Chapter 4: Here authors Barbara Means, Marianne Bakia, and Robert Murphy take on the issue of establishing some sort of typology for online learning. As the practice of learning online is such a wide and varied endeavor, it can be difficult for researchers to draw conclusions about the field. To address this issue, the authors of Learning Online propose a system that classifies online teaching methods using four categories: context, design, implementation, and outcomes. Chapter 5: In this chapter from Reusing Open Resources, authors Allison Littlejohn and Chris Pegler explore how the use of open resources expands the definition and outcomes of teaching and learning. By including open resources in educational experiences, opportunities for learning increase dramatically. Would you be willing to use the Somebody app at an academic learning conference? Being able to connect with people you know, through strangers? Getting more conversations going? I would, so I wonder whether the Somebody app could be used regularly during the eMOOCs2015 conference in Mons, Belgium (18 - 20 May 2015). Like everyone, I have my own chosen key artists. They inspire me, something in me aligns with the art they produce, and I turn to their work/ideas when I feel in need for energy or difference. One of these artists is Miranda July. To me she is a core artist, a living artist enabled to turn everyday life into art in a natural, flowing way. This morning I got an e-mail update from Miranda's mailing list, telling me the Somebody app was back to be tested (iPhone and Android enabled). The somebody app brings people together in an unexpected way. By using the app, you can share ideas or bring messages across from you to another person, but via a third person - the Somebody. 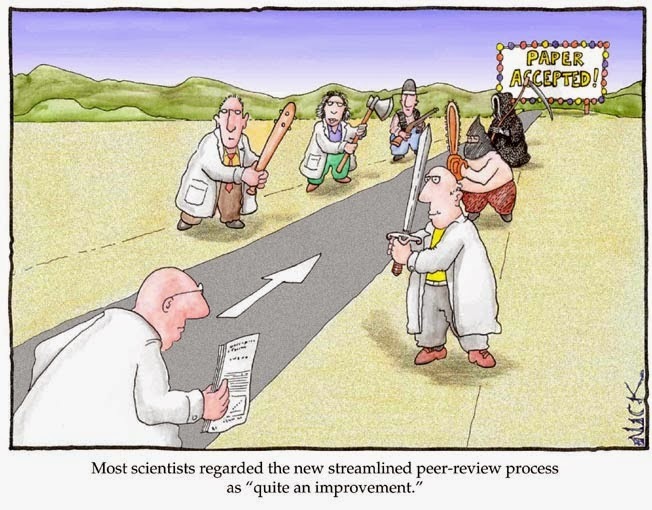 This turns any conversation into open data, open communication, open resources... I find that a wonderful idea. In many conferences I attend I have a mixed feeling of closeness and emptiness. Sometimes I know a lot of people, and that makes me feel welcomed, at other times I feel the odd one out, and I can have trouble mixing in with the other academics and practitioners. It depends on my day, the jet lag, my self-esteem at that moment, the conference atmosphere... context is always multi-layered. The reason I like this Somebody app is because it stimulates conversation = exchanging ideas, it brings people together = networking, and it uses technology in a human way. It has a lot of parallel with online learning in this contemporary world. So... would you want to use it? The app has another similarity to online learning, and particularly MOOC: the numbers threshold. In order for it to work with bewildering wonder, enough people must be using it in the same community, and gps enabled smartphones must be available and used. Nevertheless, I want to try it. Here is a video on how the Somebody app works, wrapped in a short movie directed and written by Miranda July... I love it. 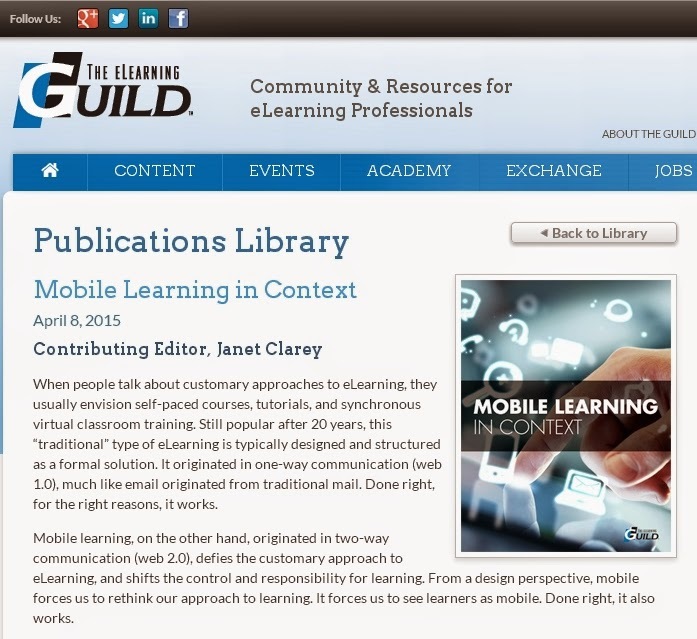 The eLearning Guild keeps distributing relevant and updated eLearning information with an amazingly high frequency. They keep providing me with information that helps me keep an eye on corporate training based regularly on academic evidence-based findings and I love it. The eBook is available in pdf, epub and mobi, making it an easy read no matter which device you have available. You do not to provide your contact details to get to the download page of the eBook. The book is an introduction to the upcoming mLearnCon 2015 which will be held in Austin Texas, and Oh-my! How I wished I could be there! But writing on my thesis ... hoping to get more travel miles under my belt once the PhD is written. In reply of a question asked by the inspiring colleague and rising academic Bernard Nkuyubwatsi from the university of Leicester, I have grabbed my three research instruments and put them on Academia, here. Post-course: one-on-one interviews, investigating the reflections learners have after having finished the course. These instruments were sent to experienced online learners that were enrolled in FutureLearn courses (three courses were selected: all from a different subject area, and organised by different universities). As I am writing some parts of my thesis, and I still need to untangle some of the terms used referring to either Self-Directed Learning, Self-Determined Learning, Autonomous learning, Self Learning... I thought it would be good to share this already. 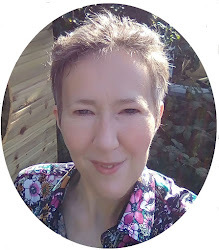 They are part of a research rationale which is partially shared in my probation report which you can find here ... writing updated chapters, but will take some time. 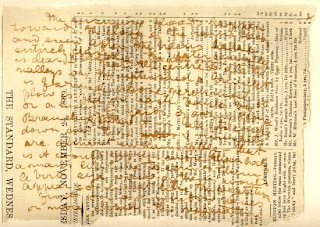 The writing paper phase is here again... so I jotted this post together to have a short document for future use. For those wanting more information, you can also take a look at the 'top tips' for educational research shared through Academia by Mike Lambert.